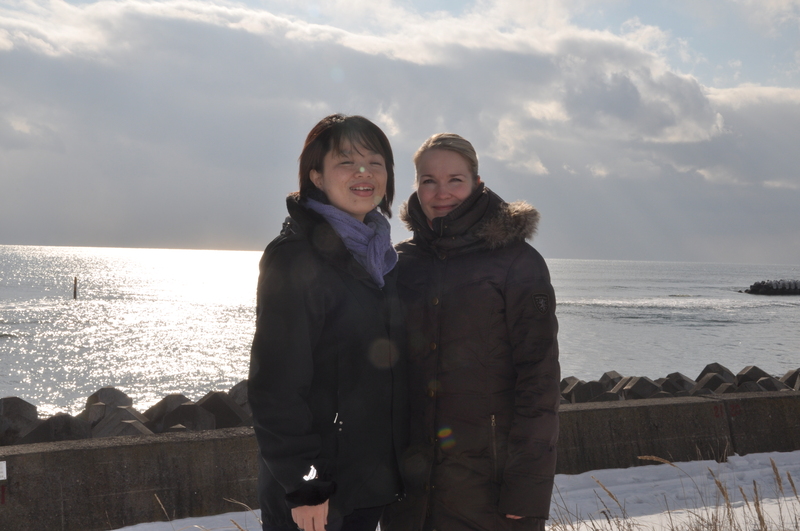 In January I travelled to Hokkaido Japan with Masumi Tanaka as my interpreter to meet Ainu people and learn more about the Ainu culture and heritage. It was my first trip to Japan, and it truly fascinated me with the beauty of the land and people: the landscape, kind smiling people, hot springs, traditional japanese sword smithy, museums, and no matter what, their delicious and healthy food can’t be left without a mention. It was very interesting and unforgettable trip, and it left me thinking how isolated indigenous group Ainu people are, and what could we do to make the world to know more about this valuable people and their magnificent culture. The least I can do is to tell you about my experience. Ainu are an indigenous people in Japan and Russia. Historically, they spoke the Ainu language and lived in Hokkaido, the Kuril Islands, and some parts of Sakhalin. It was not until 2008, when Japan’s parliament officially recognised the Ainu as “an indigenous people with a distinct language, religion and culture”. Nobody knows what is the real number of Ainu these days, because the assimilation was so strong that many Ainu are still hiding their real identity or don’t even know about their heritage. Officially Ainu population is around 25,000, but the unofficial number is upward of 200,000 people. Our way led from Sapporo city to Nibutani area, where the Ainu population is densiest. We also visited the Muroran University of Technology, and I gave there a lecture about Sámi people. Even though Sámi people and Ainu people are living far away from each other, there are still many similarities between these two cultures, for example strong assimilation policy from the state, battling with their identity, fighting for their rights, and refreshening their languages and culture. It was very touching to talk to these people who had the same kind of experiences, thoughts and feelings about their identity and life in general. I told them what it is to be a Sámi in Finland and about the Sámi culture and we exchanged our knowledge and experiences with younger Ainu generation. Even if we didn’t have a common language, we could create a wonderful connection and understanding, and are going to continue our cooperation and friendship in the future, too. One more thing in common is the tradition of animistic world view. We went to see the sacred places of the Ainu, and I really could feel the power of the land. 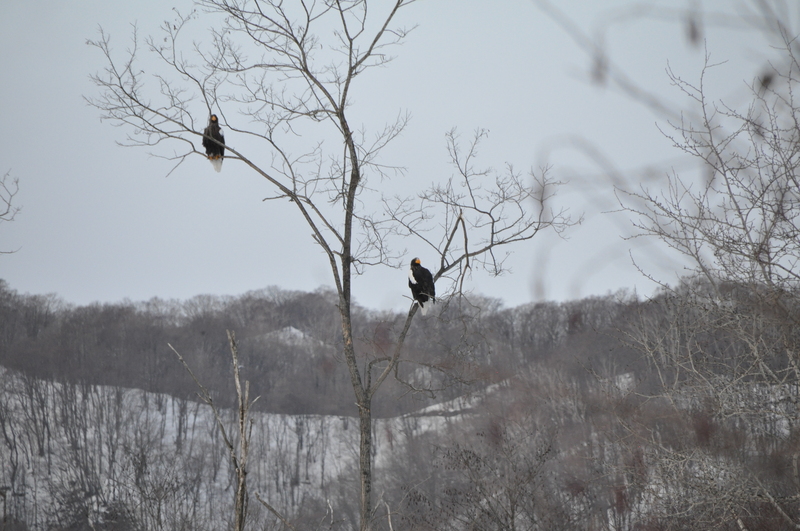 While standing there two big eagles came and started to fly around these mountains like they would’ve liked to tell us something. It was very impressive moment. Those beautiful sacred places are now in danger due to government want to build a new dam right next to these places, and if this plan really comes true these old important praying places will be destroyed for good. One dam already exists in the town of Biratori, and it has ruined one sacred mountain of Ainu completely. It also has caused other damaging impacts to this area, for example many traditional livelihoods have come to an end in many families because rice fields are now under the water, and fish cannot follow their natural routes. It makes me sad that there are not many people who know about these Ainu sacred places, and try to save them. Mr. Koichi Kaizawa is doing a great job when he tries his everything to get people awakened: there is a wonderful heritage to save and cherish. The whole trip was amazing, and not less because I had the kindest people around me. Thank you Masumi for translating and travelling with me, and special thanks to Mr. Hiroshi Maruyama, Mr. Takashi Matsuna and Mr. Koichi Kaizawa and his lovely family for all these unforgettable moments in Hokkaido! And for last but not the least, thank you Elina Helander-Renvall who made this trip happen for me in the first place. Japan is definitely the place to go back some day, so this is not a goodbye -it is take care, and see you again! This entry was posted in All, Indigenous Peoples, Sámi. Bookmark the permalink. While these colleagues are connected to the Muroran institute for technology (http://www.muroran-it.ac.jp/index-e.html), there is also a new Ainu Studies Centre as part of Hokkaido University (http://www.cais.hokudai.ac.jp/en/index.html). They try to bring Ainu Studies on a broader more general scale in to the international institutional landscape of academic exchange. They also employ Jirota Kitahara, the former director of the Ainu museum in Shiraoe, one of the few Ainu people with a PhD. We hope to witness an increased Ainu emancipation after this landmark law has recognised them in 2008. I would be interested in reading something more about the Ainu relocation from Sakhalin to Hokkaido. Kitahara Sensei talked about this, but I have never seen something about this published in english. If anybody knows, please comment. Maybe a little off topic, however, I don’t understand it, Chinese, southeast Asians, Pacific Islanders always claim that they are related to Koreans and Japanese. I mean Korea and Japan is so far off in distance with southeast Asia and the Pacific Islands. First off, the southeast Asians and Pacific Islanders originated from the Austronesian ethnicity which was linked from Taiwan via south China. The first inhabitants of southeast Asia, Pacific Islanders didn’t exist until after the Chinese who are known as the Han Chinese. The Han Chinese are the first inhabitants of China which led migration towards southeast Asia, Taiwan, and the Pacific Islands. Before the Austronesians or the overseas Han Chinese, southeast Asia were inhabited by a different ethnicities. The first, original inhabitants are the people who now settle in Papua New Guinea and Australia. Now, if you don’t believe me, search images for the people of Papua New Guinea and Australia. These people look completely different with Austronesians, Pacific Islanders, and Han Chinese. This is because the Native Papua New Guineans and the Native Australians originated from a different ethnicities which was originally from the Arabic or Caucasian origin. So, now you know that Han Chinese, southeast Asians, and Pacific Islanders are a different ethnicities from the native people of Papua New Guinea and Australia. Now, lastly, the people of Korea and Japan originated from the Ural-Altai region which is located in Siberia. These people are related to the almost extinct people of Siberia, Mongolia, regions of central Asia, Alaska, Canada, Greenland. The people of these regions are all originally from Siberia, so these people link back with Koreans and Japanese, but Koreans and Japanese are the only ethnicities to remain with a descent populations. Other than the Koreans and Japanese, the other ethncities are almost extinct. Even the first inhabitants of Japan, the Ainu originated from Siberia, but they were not the first inhabitants of Japan. History is somewhat wrong. Why would the Ainu who originated from Siberia be the first inhabitants? Korea is a country that is the closest to Japan, and during the pangea time periods. Japan and Korea were connected. Korean people were thge first to develop even before the Ainu. And, the Han Chinese in China is distantly far from Japan or Korea, you would have to cross the sea to migrate to Korea or Japan, and the Chinese didn’t create water vehicles until recently. So, you see, the Han Chinese, southeast Asian Austronesian, and the Pacific Islanders have no DNA, ancestry, origins, original cultures, physical appearances, mannerisms, et cetera relations. Also, the native Americans originated from the Arabic ethncities which includes the middle-east, Latin Europe, which means that the native Americans also have no relations to the Koreans and the Japanese. The reason why certain people think some ethnicities have the typical Asian physical appearances is because when people travel towards the northeast directions, the physical appearances develop with differences. People of all ethncities mixed with different ethncities, but Korea and Japan were pure for a certain period of time due to cultural backgrounds. The Han Chinese and every other ethnicities other than Korea, Japan, people of Ural-Altai backgrounds migrated to different regions and intermarried with all different types of different ethncities. How do I know all this? I am Japanese. Japanese ethnogenesis has been a much-studied topic, particularly in Japan, which you may know better than we do. Most of the recent works state that the Japanese origin is anything but clear. Multiple theories continue to compete. The most authoritative source within Japan on this seem to be the publications of Minpaku, Bulletin of the National Museum of Ethnology. Check for example the article by Komei Sasaki in Vol. 34, No. 2 2009. He writes “Through continued research on this topic, we have come to share the recognition that Japanese culture cannot simply be defined as a single, homogeneous, rice-growing one. Instead, it is a combination of several cultures with different origins and is multi-dimensional and multi-layered in nature”. We should leave it to the specialists to come to conclusions about the kinship between Altai-Uralians and Japanese. There is genetic research evidence for example on this, which is not our field in anthropology. As far as the Koreans are concerned, Hudson (1999) holds that they came to Japan as agriculturalists around 400 BC to AD 300, when the ancient Jomon population was already there. That Jomon population, in turn, is believed to carry the much of the same genetic markers as the Buryats of Siberia, who, importantly, are not extinct what so ever. That genetic research also shows the relatedness of the Ainu and Japanese, who are then both related to the ancient Siberians. Here is a good other blog post about this and Hudson’s 1999 work “Ruins of Identity: Ethnogenesis in the Japanese Islands” is a good source too. Speculations on purity or peoples on the ‘verge of extinction’ as you suggest should be left out if not backed up by solid scientific findings. We have done extensive research in Siberia and therefore know that the indigenous population there is NOT extinct whatsoever. This shows that it does not make sense to play out Ainu and Japanese against each other on the basis of who was there first. After their very recent legal recognition of Ainu in Japan, we are happy if contemporary anthropological research contributions to a strenghthening of their cultural identity. Most importantly: most anthropologists would agree today that ethnicity is not a static construct that just ‘evolves’ at a certain time and then stands still for ever. We would never apply some ominous ‘purity’ criterion to assigning certain rights to certain people. Ethnicity and ethnic identity is dynamically changing in relation to many other factors. The entry to which you commented shows that international indigenous exchange such as between Ainu and Sami contributes to these processes of change and consolidation. And for this increased ethnic awareness, we do not need a finite answer on neither Japanese nor Ainu ethnogenesis. There are no tips for success. It’s the response to preparation, hard work, and gaining knowledge from failure. Many men speak to failure due to their insufficient persistence in creating new offers to substitute for people who fail. You cannot no longer see pure blooded Ainu only mix with Japanese or Russian. This is a blog about SOCIAL and CULTURAL anthropology of the Arctic, including but not limited to indigenous peoples. The discussion forum that commenter Ainu points to is about PHYSICAL anthropology, which many of us social scientists try to distance ourselves from. We usually don’t discuss issues of racial pureness and blood relatedness, and it is clear that nowadays most people are genetically mixed. It is easy to get accused of racism when engaging in such discussions, but the discussion forum that commenter Ainu mentions has a clearly stated user etiquette against racially inflammatory posts. This is a very interesting and enjoyable post. I am very interested in both the Ainu and the Sami people. I live in Japan but very far from Hokkaido, but someday I want to visit the Ainu areas such as Nibutani. Good for you for making people more aware of both Ainu and Sami cultures. In Japan it seems like people don`t know about the Ainu even though they are a part of Japan. It seems similar to being an American or Canadian and not knowing anything about the Inuit people. So I hope that more Japanese people become aware of the Ainu people. As someone who lives in Japan and is quite familiar with Japanese culture, I know about the historical and cultural attitude here of the ethnic or racial homogeneity of Japan, but I hope that gradually attitudes change and that people in Japan who have Ainu heritage can one day celebrate it and be proud of it, rather than hide it. So, thank you for writing this! Thank you for this wonderful and informative post about your experience meeting the Ainu people. I am an American who lives in Japan and I am very interested in both the Sami people and the Ainu people. I wish that Japanese people who have Ainu heritage could and would be proud of it and celebrate it instead of hiding it. I think Ainu culture should be celebrated and promoted as part of the richness of Japan. It seems like most Japanese people don`t know much if anything at all about the Ainu. Anyway, I am glad that you have educated readers of your blog about this fascinating ethnic group in northern Japan.